Tagging sharks is vital to understanding population dynamics. The following story is contributed by the Florida Museum of Natural History, www.flmnh.ufl.edu. From the Atlantic to the Gulf of Mexico, Florida Museum of Natural History researchers are busy studying sharks in nursery areas to better understand population dynamics and habitat use. In August, biologists Jason Romine and Johanna Imhoff offered a first-hand glimpse into two of these projects. First stop: A day tagging juvenile sharks in the Gulf of Mexico. The Florida Program for Shark Research boat had barely enough room for its three occupants. The 17-foot flat hull held two large garbage pails for gill nets, three large orange buoys, three anchors, a measuring board, several ice chests and assorted tool kits and waterproof boxes that held an array of gear and scientific equipment. The program is currently seeking a new donated boat. 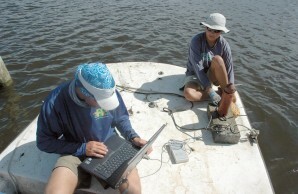 Florida Museum research biologist Jason Romine uploads data onto a laptop from a listening device that biologist Johanna Imhoff has retrieved from the bottom of Indian River Lagoon. The device records movements of juvenile bull sharks the researchers have implanted with acoustic tags. Three days a month, from May to October, Florida Museum researchers set gill nets along a stretch of Gulf coast from Suwannee Sound to Crystal River as part of a juvenile shark survey sponsored by the U.S. National Marine Fisheries Service. Six research units from Florida to Texas take part in the project, known as the Cooperative Gulf of Mexico States Shark Pupping and Nursery (GulfSPAN) survey. People might assume that shark research is well funded, but commercial fishing drives much of the research agenda, Romine said. 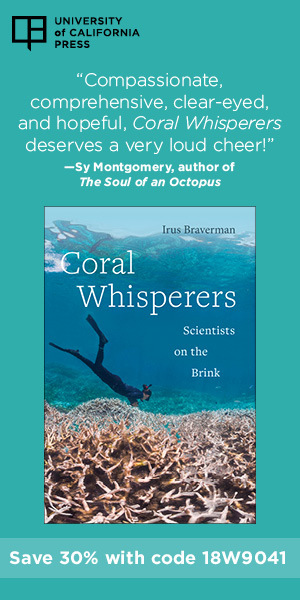 Fishes such as grouper and snapper receive more research funding than sharks. For the GulfSPAN project, the Florida Museum receives only $4,500 a year. 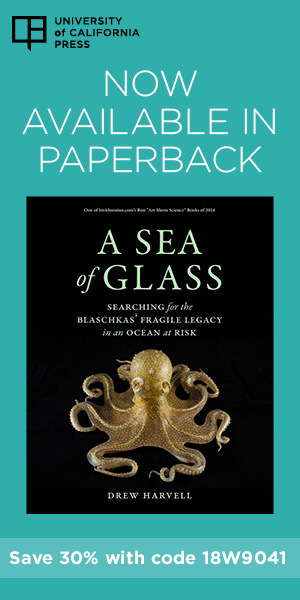 On this particular day, Romine and Imhoff planned to string a 10-foot-deep, 600-foot-long gill net at three randomly selected GPS coordinates within the study area. Sinkers sewn into the bottom of the net kept it stretched down into the water column. The boat’s GPS unit indicated the boat had neared the first location, about two miles from shore. Romine dropped the engine down to slow speed, found the spot and set the boat’s bow perpendicular to the waves. Imhoff stepped up to the edge of the bow and dropped an anchor and buoy attached to the end of the net. Romine then set the boat in slow reverse as Imhoff eased the net into the water from two 32-gallon containers. As the first container emptied, she dropped a small buoy to mark the halfway point and switched to the second container. After Imhoff attached the final anchor and buoy to the end of the net, Romine moved the boat about 100 yards away. Here they dropped anchor for the hour-long wait before pulling it back up. When the time came, Romine and Imhoff stood together on the bow. The boat slowly moved forward as they pulled in the net. On any given outing, the nets can produce a mix of bonnetheads (Sphyrna tiburo), blacktips (Carcharhinus limbatus) and Atlantic sharpnose sharks (Rhizoprionodon terraenovae). Their first haul of the day brought in 10 live sharks and four dead ones, ranging in size from 1.5 to 3 feet. They measured and tagged each live shark before releasing it, taking turns as the other continued pulling in the net. Dead sharks were later cut open to look at stomach contents. Florida Museum researchers have been collecting the juvenile shark data for the last four years. From that data a picture of sharks’ habitat preferences is beginning to emerge, Romine said. Ultimately, he hopes the project results in enough baseline data to give a good idea of whether the Gulf’s shark populations are going up or down. The next week, Romine and Imoff laid long lines to tag bull sharks (Carcharhinus leucas) in Indian River Lagoon. Bull sharks, a species of concern in Florida, use the lagoon as a nursery and stay there until they are about nine years old. Florida Museum researchers use acoustic tags and a network of listening devices within the lagoon to learn more about their behavior. The study area covers about 60 miles of the lagoon, from the Banana River, which is just south of the Kennedy Space Center, down to Sebastian. To catch bull sharks, Romine and Imhoff used a steel-cable long line with 50 hooks attached at 30-foot intervals with a five-foot piece of 1200-pound test monofilament. Some of the sharks received acoustic tags that send signals to receivers placed throughout the lagoon. The device records the tag number, time and date whenever a tagged shark swims within 150 meters of it. Many of the receivers are located near power stations and creeks to determine how human-based changes, including the destruction of mangrove habitat, might be affecting the lagoon’s inhabitants. Romine and Imhoff launched from the boat ramp at Barefoot Bay, near the southern edge of their research boundary. The two researchers strung a long line baited with jack and let it sit for two hours before returning to see what they caught. The first hook held a 4.1-foot bull shark, an immature female. Romine pulled the shark to the side of the boat and tied the long line to the bow as Imhoff worked to lasso and secure the shark’s tail. Romine then rolled the shark onto its back, which exposed the belly and turned the shark docile. Using a scalpel, Romine cut into the shark’s body cavity and implanted the acoustic tag, which is about the size of an AA battery but half as long. Imhoff then stitched the incision, inserted a visual tag into the base of the dorsal fin and measured the shark’s length. Their work completed, Romine removed the hook with bolt cutters, and Imhoff released the tail. Romine then turned the shark onto its belly and held its fin until it recovered from the shock. As the shark regained its strength, Romine let go and watched the shark swim away. Each listening device is marked by two small buoys, one on the surface to mark the location and another underwater to show where the line is. Imhoff used a hook to grab the line and pull up the device: a metal canister about a foot high attached to a small cinder block. The cinder blocks themselves are attached to larger blocks of concrete on the lagoon’s bottom to keep them in place. Romine plugged a USB cable into the receiver and uploaded its data into a laptop computer. He then could see whether any tagged sharks had passed the receiver and when during the weeks since he last checked the device. To read more about the shark tagging trips, visit Science Stories.